Let’s make an easy DIY coffee station on a budget! Here’s how you can do it. Check out these 15 easy tutorials and project ideas. Most of us start our day with a cup of coffee – it is somewhat of a ritual. And because your coffee maker is almost the first thing you see when you open your eyes in the morning, it better be a pretty sight. That’s why we like the idea of building a temple for coffee at home. 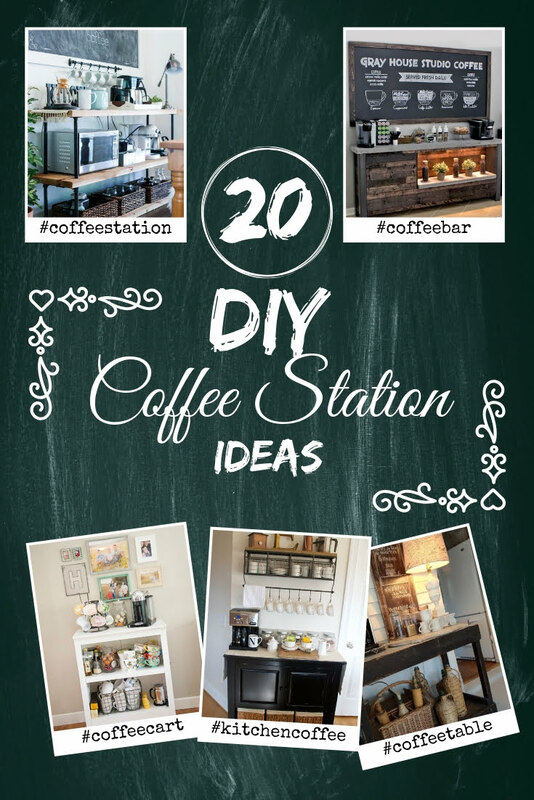 Here are our 15 great DIY coffee station ideas for you to pick inspiration. Want to build a DIY coffee table too? Decorate your new coffee station. To complete these steps choose one or more of the following tutorials. A simple yet very stylish design to build a coffee station from industrial-style pipe shelves. We already appreciate shelves in this style but making a coffee station from it adds that significant accent and makes a high focal point in your decor. 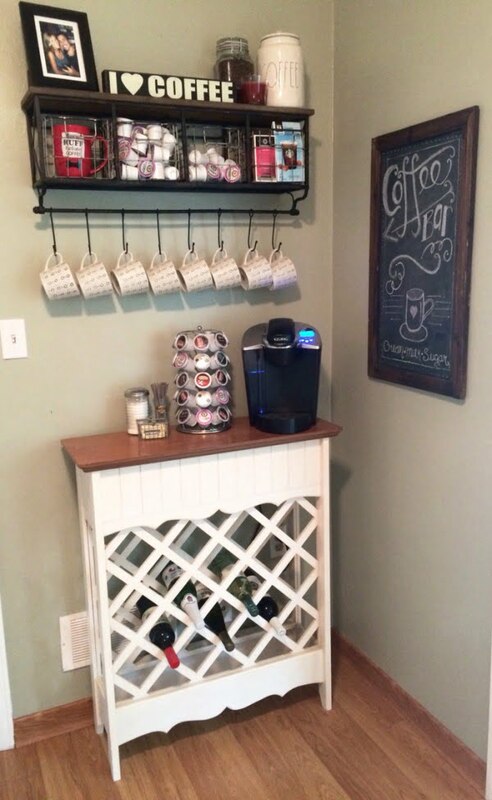 Who would have thought that a wine rack makes such a great coffee bar? But indeed, it very much does, and it’s very well topped off with an attractive industrial style mug rack in this example. 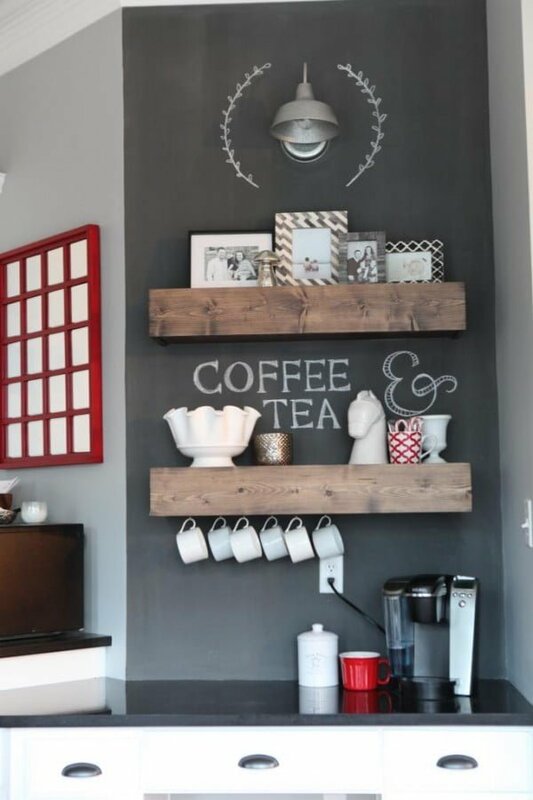 Add a chalkboard sign art to that, and you have a brilliant coffee station idea for your home. There is so much goodness in this rustic coffee bar, and if you love this style as much as we do, you’ll want to commit to building this wonder at home. It is a committing project, indeed, but having such a remarkable decor statement at home is all worth it. 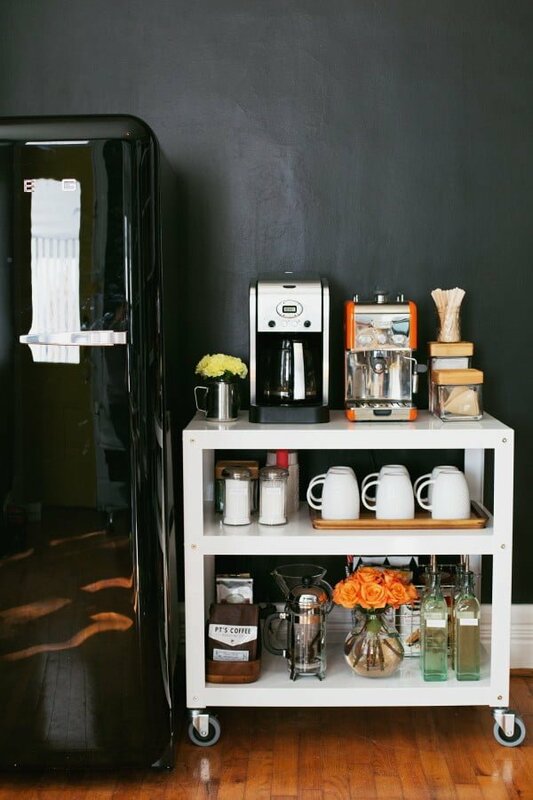 A coffee station can be as simple as a small cart on wheels, and that’s all it takes. You get a mobile bar that you can position in any free corner. The important thing is to create a display that will make a decor statement with it. Vintage decor details are very visually appealing because they pop in modern decor style. So if you want some variety in your decor that makes it look well thought out and complete, use something vintage. Here’s how you can build a small coffee station from a vintage crate. This coffee station is beautifully done, but we like the idea of its positioning even more. It’s unexpected to find a coffee bar outside the kitchen, but it works so well if you embrace this option. The table lamp emphasizes the choice of the placement of the bar and makes the vintage desk work so well as decor statement. 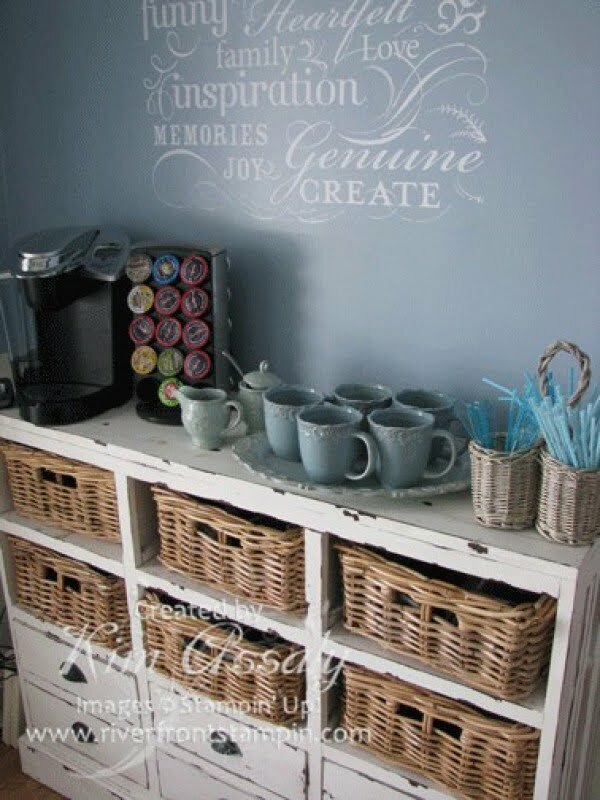 If you think about the coffee station as a decor vignette, you can extend it from a piece of furniture to the wall art. Create a corner at home that makes you happy and that you like using and looking at. 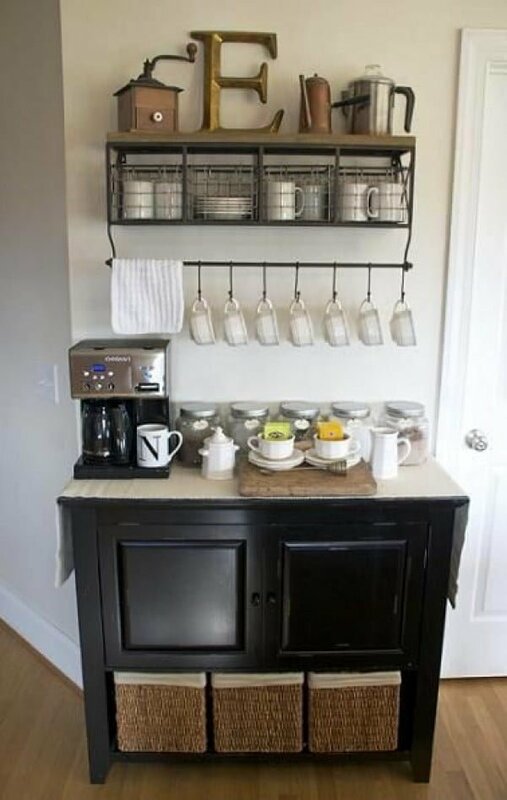 What you need to create a coffee station using this idea is a small cabinet in any style you like (rustic or vintage works very well) and a mug rack or a shelf that you can DIY yourself. Add an attractive sign to top it off, and you get a real focal point for your decor. 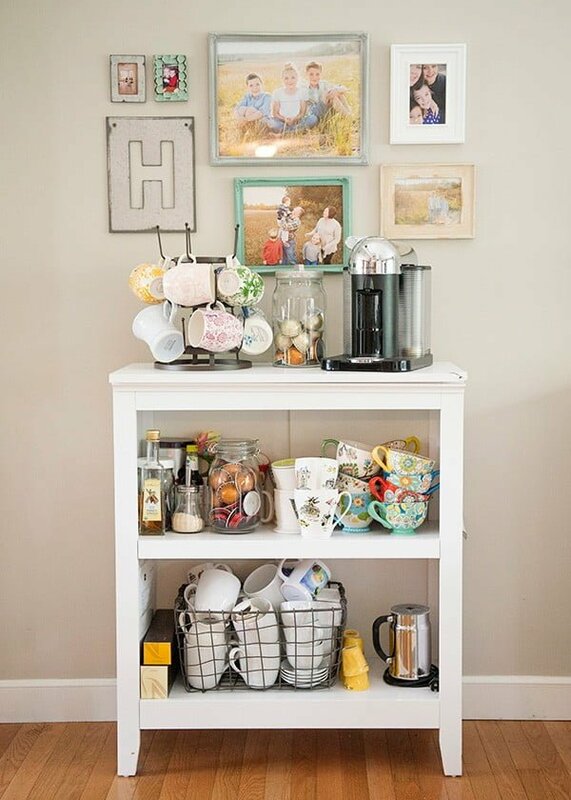 If you need more storage space at home, you can use a coffee station that doubles as a storage unit. That is exactly what this idea is all about. It uses space effectively and provides ample space with a lot of visual interest. You can place a coffee station like this in any corner. 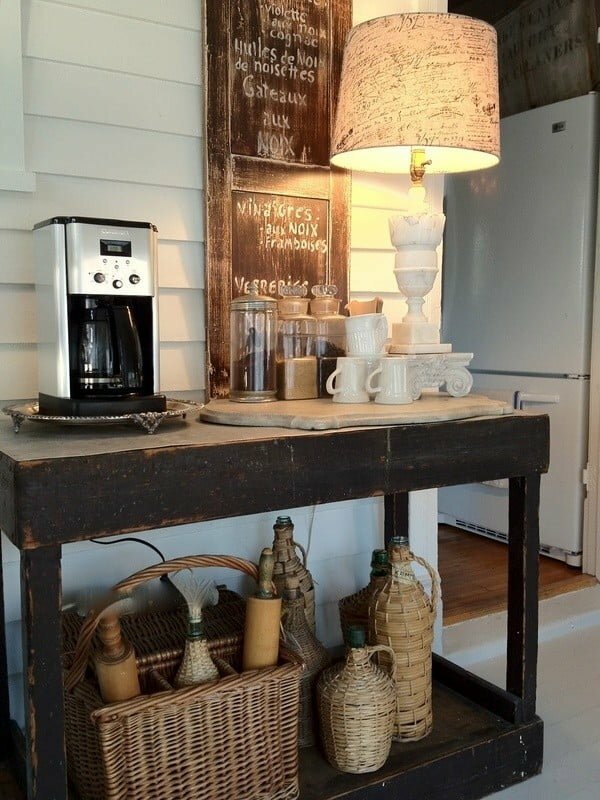 The focal point of this coffee station is the DIY pallet shelf and a mug rack. It gives that rustic accent which makes the whole station stand out. It’s a great inspiration for those awkward and challenging to use empty corners in your home. 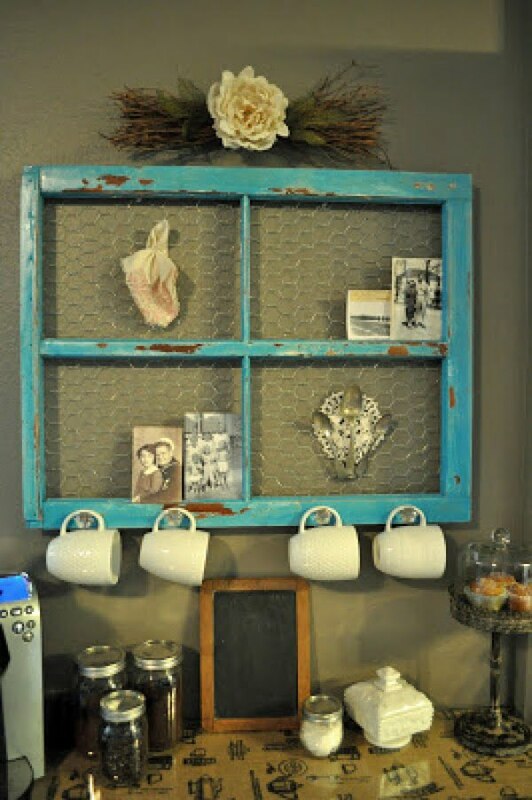 Repurposing is a great way to create unique accents, and we love this idea to use an old window frame as a mug rack and part of the coffee station. Of course, you need to paint and distress the window frame for an authentic look, but in the end, it’s very well worth the effort. 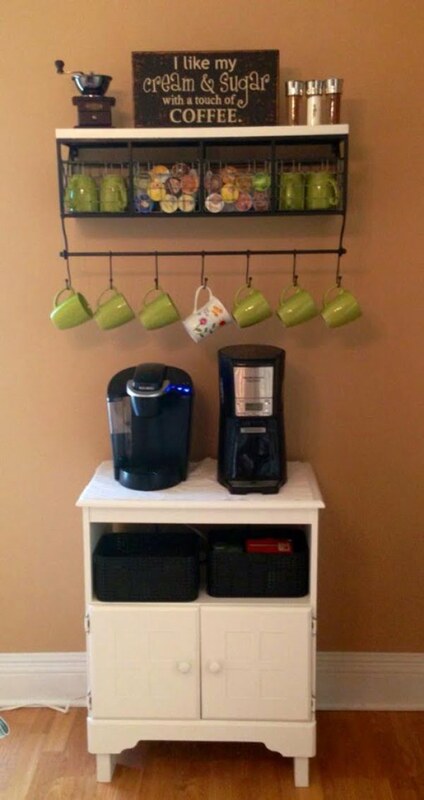 If you want to turn a desk into a coffee station, all you may need is to install two suspended shelves on the wall over the piece of furniture. The look is complete with rustic accents of the shelves and the chalkboard-painted wall. Your coffee station can be as small as a wooden tray with a mug rack, and it will work. Sometimes straightforward ideas make the most sense, especially when you’re dealing with small spaces. What we love about this coffee station idea is the weathered look of the vintage cabinet complemented with the wall decals. It creates the cafe-like look that will make a strong decor accent in your home. 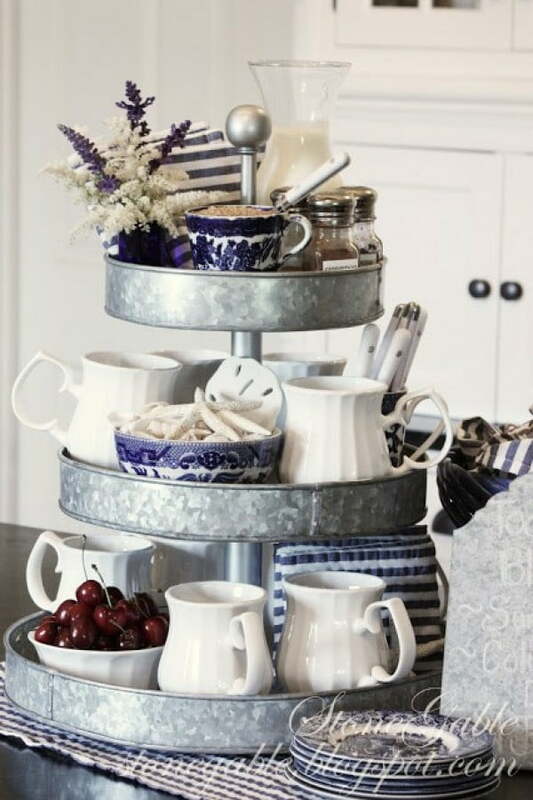 A tiered tray makes a great mobile coffee station and takes very little space. So if all you have is some free countertop or kitchen island space, but you still want to have your coffee bar, this is the perfect idea for you.